Easter gift giving is a fast growing tradition among many families. The gifts do not have be large, but something from the heart will get everyone excited to celebrate the rebirth of spring. While traditionally gifts have been given to children such as a stuffed bunny or a chocolate egg, it is perfectly for everyone to partake. During this time Easter baskets are very popular filled with small treats for the kids and the kids at heart to enjoy. But as well, gifts can be exchanged amongst adults. This trend is hopping along in popularity, so why not exchange a few small gifts as the family gathers for a festive Easter brunch? Easter is typically filled with coloring eggs, Easter baskets and spending time with family. But this year, Hallmark would like to introduce you to Mama – a Squawkin’ Egg Droppin’ Hen. That’s right – Mama is in the house! Although Mama made her ‘egg-cellent’ debut last year, she completely sold out of stores and is back by popular demand! 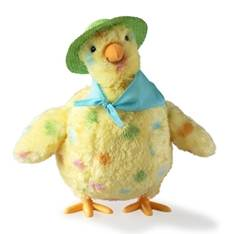 Sporting a new straw hat and scarf, Mama’s ready for Easter and ready to lay some eggs – in a not-so-ordinary way. Great for entertaining, this soft plush hen will surprise and delight any family by bobbing up and down to a parody of “Whoomp! (There It Is)” as she lays Easter eggs. To see Mama in egg-laying action, please check out this video or simply ‘cluck,’ I mean click, on the image of Mama above. The Squawkin’ Egg Droppin’ Hen is $15.95 (regularly $30.95) with the purchase of three cards at Hallmark Gold Crown stores and can be found at a store near you. The hen is so soft and fluffy and fun to watch , for all ages! This would make a great addition to any Easter basket! Be sure to also pick up your Easter cards from the Signature Collection – these unique cards are handcrafted with glitter, embellishments, and thoughtful sentiments to warm anyone’s heart this Easter and are quite nice...I loved them- think they will be a hit with anyone I give them to this Easter. When creating Easter baskets, it’s fun to go beyond chocolate bunnies and peeps and include festive yet unexpected products. The “Forever Springtime”, is one of Soft soap’s newest limited edition body washes. It’s made specifically with Spring in mind and the Spring themed packaging would look great in an Easter basket or even just to turn an everyday shower or bath into a bright and colorful spring/Easter afternoon !